"China represents and will remain the most significant competitor to the United States for decades to come. As such, the need for a more coherent U.S. response to increasing Chinese power is long overdue," write CFR Senior Fellow Robert D. Blackwill and Carnegie Endowment for International Peace Senior Associate Ashley J. Tellis in a new Council Special Report, Revising U.S. Grand Strategy Toward China. "Because the American effort to 'integrate' China into the liberal international order has now generated new threats to U.S. primacy in Asia—and could result in a consequential challenge to American power globally—Washington needs a new grand strategy toward China that centers on balancing the rise of Chinese power rather than continuing to assist its ascendancy." 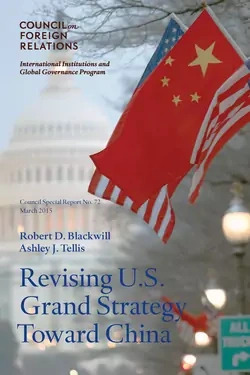 The authors argue that such a strategy is designed to limit the dangers that China's geoeconomic and military power pose to U.S. national interests in Asia and globally, even as the United States and its allies maintain diplomatic and economic interactions with China. "Nothing would better promote the United States' strategic future and grand strategy toward China than robust economic growth…This must be the first priority of the president and Congress." "Congress should remove sequestration caps and substantially increase the U.S. defense budget...Washington should intensify a consistent U.S. naval and air presence in the South and East China Seas," and "accelerate the U.S. ballistic-missile defense posture" in the Pacific. "U.S. grand strategy toward China will be seriously weakened without delivering on the TPP [Trans-Pacific Partnership trade agreement]. A major push by the White House for ratification should therefore begin immediately in the new Congress, including seeking trade promotion authority." "Washington should pay increased attention to limiting China's access to advanced weaponry and military critical technologies." The United States should encourage its allies "to develop a coordinated approach to constrict China's access to all technologies, including dual use." Washington should "impose costs on China that are in excess of the benefits it receives from its violations in cyberspace…increase U.S. offensive cyber capabilities . . . continue improving U.S. cyber defenses," and "pass relevant legislation in Congress, such as the Cyber Information Security Protection Act." "The United States cannot defend its interests in Asia without support from its allies," and "should build up the power-political capabilities of its friends and allies on China's periphery." The United States should work to mitigate tensions with China, and "reassure U.S. allies and friends in Asia and beyond that Washington is doing everything it can to avoid a confrontation with China . . . U.S.-China discourse should be more candid, high-level, and private than is current practice." U.S. competition with China continues to intensify, but rather than adopting a strategy of containment, the United States should respond by reinforcing its relationships with allies and leveraging China's desire for stability to discourage disruptive behavior. Trump's rebellion against the rules-based order may give the United States more freedom of action, but it undermines the ability of the United States to influence its own future in a global era.